This is the sixth post in a series about “No Spectators: The Art of Burning Man,” the upcoming exhibition at the Renwick Gallery of the Smithsonian American Art Museum. “No Spectators: The Art of Burning Man” opens at the Smithsonian American Art Museum’s Renwick Gallery on March 30. Thirty years of art and community, culture and collective practice will be on display through representational objects of art, costume, jewelry, and memorabilia. This is, clearly, a celebratory moment. It is also a moment to pause. To reflect. To consider, and to choose. The choice I propose we make is to simultaneously participate in and enjoy the exhibit while also holding close to the culture from which this work springs. I propose we remember that these artists are incredible and belong to a family of artists, most of whom are not included in this exhibit. It is not possible to include all the hundreds and hundreds of Burning Man artists — and it would be incredibly short-sighted to call these the “best” Burning Man artists — even as it is clear they deserve to be considered the “greats.” Let’s remember that the realm of artists who’ve been making work for TTITD is expansive and includes not only other greats but also many not-so-greats, made-you-laughs, and broke-down-on-the-way-to-the-playas. The Burning Man world should be both sublimely appreciative of the opportunity to be represented at the Smithsonian and supremely cautious as we work to effectively communicate that the culture is comprised of people, not just objects. The people of Burning Man are people who do, who create, who give, who participate, who invent, who celebrate, who hug, who build, who believe in impossible and magnificent things. A fire-breathing dragon (Flaming Lotus Girls), a 70-foot tower of flowers (Reared in Steel), a 40-foot flamingo (Josh Zubkoff), a giant octopus (Peter Hazel), a set of 5,000 ton rocks suspended in air (Zac Coffin), a Space Whale (Matt Schultz/Pier Group)??? No problem! It’s Burning Man. So, let us remember that Burning Man does not seek to be legitimized by institutions; if anything, we seek to change entrenched cultures and to provoke new possibilities. 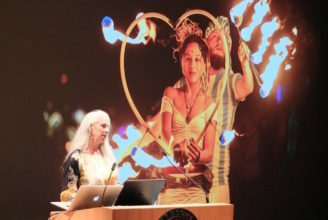 Over the last 18 months, Burning Man Project has worked to counsel, advise, prompt, and petition the Smithsonian to consider new ways to be inclusive, to reimagine participatory experiences within the museum context, and to create more authentic interactions by inviting local Burners to engage. They have been receptive, and they have limits to what they can offer inside of four walls. They’ve been diligent in their research and the curator, Nora Atkinson, has been supported by SAAM Museum Director, Stephanie Stebich, to explore a point of view that is thorough and respectful of the art of Burning Man. We applaud that. We are overjoyed that the artists in the exhibit will have their work seen and appreciated by people from around the world. The Smithsonian is, in fact, Radically Inclusive and open to the public with free admission all year round. As we near the opening of the exhibit, it is my hope that we will choose to show up with a joyful spirit. That we will engage with each other and with the people who will be coming to the exhibit, many of whom will have no knowledge of the culture beyond the sensationalized hype we so often see in the media. That we will invoke the spirit of the Greeters, the Rangers, the DPW, the Gate, the ESD, the Fire Safety Team, the builders, the doers, the givers of Burning Man. They are also the artists, the culture bearers, the historic and future wellspring for the community — the gift that cannot be intermediated, only lived. Let that voice, that spirit, that presence be brought forth through each of us who attend the exhibit and let it live in us; it is the collective, it is the process, it is the lived experience that is the fine art of Burning Man. Kim Cook is Director, Art & Civic Engagement, managing the teams that deliver Civic Arts initiatives, Burners Without Borders, and Art to the playa, including Honoraria and Global Arts Grants programs. Can’t wait to see everything tomorrow night! Thanks for the all the good reminders, Kim. I’ll be volunteering weekly through the duration, so your advice is appreciated! Even though I could only prowl and peek a week too early, I couldn’t help but feel that good Burner energy pulsing into Pennsylvania Avenue. I hope to make it back before it closes, but man, either way, this is just terrific. Thanks to all for making it happen. It gives Hope in knowing that this Goodness radiates just a few hundred feet from the place that needs it most. I had the pleasure and honor to attend the Artist to Artist event Wednesday evening. I was totally amazed at the breath and beauty of the exhibit. The staff of the Renwick has done an amazing job capturing the essence of what Burning Man is to me, amazing art in many forms. The happiness and joy that I encounter at Burning Man permeated the event, artists were so proud to explain their contributions. It seemed to me that everyone from the locals to the guests were amazed. Consider the 10 Principals, be Inclusive, it is a perfect time to inspire and invite everyone to join us on the playa, support the Communal Effort everyone has shown, to bring this event to the world. See you soon again on the playa.